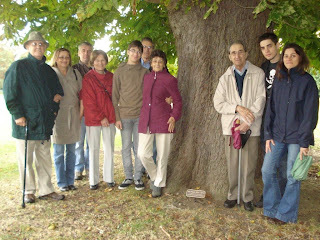 A memorial for Ivor Pearl was unveiled by his sister Margaret on the Wale Recreation Ground on September 23. This is the eulogy, written and presented at Ivor's funeral by Ray Saich. Ivor , affectionately known as ‘Pudding’ was born on the 25 August 1934 at 29 Hauxton Road, Little Shelford. He was the second son in a family of five Pearls to Robert and Eva Pearl. He grew up in a happy household with very little squabbling and Ivor was seen to be very generous even from an early age. Their playground was the meadow behind their house and although they did not have family holidays, they always went on a double decker bus for an outing to the sea from the Plough public house. Ivor attended Gt & Lt Shelford Primary School to the age of eleven and then he moved to Sawston Village College, cycling daily with his older brother Keith. When he left school aged fifteen he attended the Technical College in Cambridge for a year. He then joined Rattee and Kett and began a five year apprenticeship as a bricklayer and continued studying at the Technical College. After initially working on the construction of new buildings for the University and Cambridge colleges, his talent and ability soon impressed and he transferred to the specialist restoration side of the business. His skills working with stonemasons were soon put to good use repairing bomb-damaged churches and he became a master craftsman in the repair of old buildings. In fact, if there was an Oscar for repairing historic buildings, Ivor would have won it as he was involved in work on royal palaces, stately homes, churches, cathedrals and colleges, for which the company received many awards and the Royal Warrant. A fitting tribute to the memory, after working fifty years at Rattee and Kett, of this modest man, are the words used by Sir Christopher Wren’s son ‘IF YOU SEEK HIS MEMORIAL, LOOK AROUND YOU’. Ivor’s great love was cricket. He began playing for Little Shelford in 1950 and had been involved with the Club ever since. First he became a committee member and then treasurer, a position he held for thirty-seven years. He was the groundsman, cutting the square and wicket before matches. Every Easter a heavy roller was hired to roll the whole square. No need to guess who spent most time on the roller, regardless of the weather. Margaret found one of his pocket diaries. It read ‘Heavy roller this weekend; ‘Away to Bottisham’; ‘Home to Newton’. The diary contained no other information unless it was connected with cricket. Ivor was a good batsman, and past cricketers recall how he had the great ability to wait and play the ball at the last possible moment. He also added wicket keeping and spin bowling to his credits. Ivor also served for a number of years on the committee of the Cambridgeshire Cricket Association. Only in February of this year, a couple of weeks before their AGM, he rang to remind me that we needed a representative from the Club to attend the meeting to avoid being fined for non-attendance. Even after Ivor was no longer on Little Shelford’s committee, whenever there was a meeting, he would like to be included. He was like a father figure looking after us all. Cricket, his summer sport, was replaced by badminton during the winter months. He played in and captained the men’s and mixed teams for many years. While serving on the committee he became the club’s treasurer. As with cricket, he was a great supporter of any youngster joining the club and most of the present ladies’ team remember his good advice and support. In his later years he became more involved with the village Bowls Club. Here again he became a member of the committee and took on the role of treasurer, a position he continuously held from 1987. Ivor was appointed to the Parish Council in 1977 and had been Vice-Chairman since 2004. Amongst his many duties he took responsibility for the Wale recreation ground, especially the children’s play area and for overseeing the tidying and general maintenance of the village. He performed the task every Christmas of locking the gate between the recreation ground and Courtyards to stop this route from becoming a public right of way. It is only down to Ivor that the recreation ground still belongs to Little Shelford. South Cambridgeshire District Council wanted to take ownership of all such grounds and Ivor was absolutely adamant that the Wale family had given it to the village. His determination won the day. In Council meetings Ivor was always keen to preserve the traditions of the village and village life. He was also an excellent ‘interrogator’ of County and District Councillors, especially where he felt that the interests of the village were being threatened or where he considered taxpayers’ money was being spent unnecessarily. 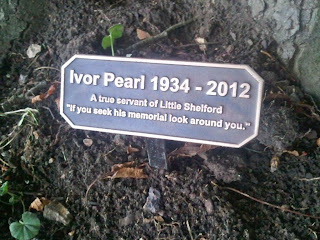 In 2010 the Parish Council put forward Ivor’s name as Little Shelford’s ‘Village Hero’ as an acknowledgement of their appreciation for his contribution to the village. He did not win the top award but was presented with a Certificate of Commendation by the South Cambs District Council. Ivor was also a valued Trustee of the Memorial Hall, a position he held for over twenty-five years and he inevitably took the role of ‘yes’ treasurer. Ruth Shah recalls that all correspondence for her was marked ‘Pearl Post’. Whenever there was an event in the hall you knew Ivor would be there at the end of the evening stacking chairs and tables and generally helping to tidy up. He made certain the hall bins were put out for collection every Sunday evening and he did general maintenance around the hall. Ivor always put others before himself. On the Friday evenings of the Fun Weekends, while the dining and dancing were taking place, he would open the Bowls Club pavilion, put on the lights and stay there all evening so that the toilets were made available to the lady revellers. · A man who could turn his hand to most things and who would help train the next generation of craftsmen. · A man who when you had a difficult job would say ‘Leave it to me’ and you could – although sometimes you would need to join the queue. · A man held in the highest regard by his colleagues and friends. · A man who would help anyone. · A man you could depend and rely upon. · A kind and considerate man. · A man who lived by a moral code. · A man with a sense of humour who enjoyed a laugh and a joke. On a personal note, the Saich family will always remember Ivor every time we go into our house, for the walls he built, the lintels he put in place, for new doors and windows and the sound advice he shared. With a twinkle in his eye, he always delighted in telling us how he had helped his father to install cupboards in the house for the previous owners. They were built to last and not come down ...............as we struggled to remove them. This village that Ivor loved so much and devoted his life to, is going to miss him immensely. I know many of you here will have memories of Ivor - I feel very honoured to have been asked by the Pearl family to speak about him today. And on behalf of LSHS how appropriate it is that Ivor’s coffin should be here in the church, on the Village bier, especially as Ivor was so supportive of its return to the village. He was keen to relate how, with his brother Keith, they had pulled the bier from Leagrove Cottages to this church for their father, the local undertaker.